Medical assisting is a growing field across the country, and in the big state of Texas, growth is no exception. Long term projection of employment growth for medical assistants in Texas is expected to increase by about 32 percent, according to Projectioncentral.com. The Texas biocorridor, located in College Station less than two miles from Texas A&M University, is expected to be large employer of medical professionals at all levels. While formal training isn't required to work as a medical assistant in Texas, finding a medical assisting job may be easier with some education under your belt, and the state has a variety of education options. If you are interesting in joining this growing field, read on to find out about employment trends, salaries, certification, training and medical assisting schools in Texas. Completing a degree in medical assisting can lead to career advancement and personal fulfillment for any student, but it is important to maintain life’s priorities. We’ve put in the work to find the best programs offered throughout Texas, basing our findings on graduation rates, tuition cost, and available academic services. 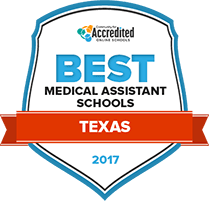 Look below to find our list of the best medical assisting programs available in Texas for 2017. Students can pursue either a certificate or an associate of applied science degree through the medical assistant program at Panola College. The 60-credit AAS degree takes four semesters to complete, and the certificate path is a two-semester program that includes 29 credit hours of coursework. Students will leave both programs prepared for entry-level work assisting physicians and other healthcare professionals. The school offers academic advising, placement testing, childcare assistance, disability services, counseling services and access to a fitness center. The Texas Success Initiative uses testing to help place students in the appropriate academic environment. Potential academic tracks for the Cisco College medical assisting program include three different certificates and an associate of applied science degree. The program is accredited by the Commission on Accreditation of Allied Health Education Programs. Those who earn the AAS or complete the level III certificate program will be qualified to sit for the American Association of Medical Assistants certification exam. There are a wide range of clubs and organizations with themes as varied as science and rodeo. Student resources include tutoring, academic intervention and recovery, the Transition Center and several seminars and workshops. The medical assistant program at McLennan Community College, which is accredited by the Commission on Accreditation of Allied Health Education Programs, results in an associate of applied science degree. Graduates will be qualified for immediate entry into the workforce, or they can use the degree as the foundation for continued education towards degrees in nursing or related fields. Students will have access to a wide range of benefits and services, including tutoring, academic advisement and career services. The library provides a variety of research tools and other academic resources, and students will have access to the bookstore both in person and online. The 24-month medical assisting program at Northeast Texas Community College culminates in an associate of applied science degree that is accredited by the Commission on Accreditation of Allied Health Education Programs. Graduates will be prepared to take the national credentialing exam, which a large majority of program graduates pass on their first attempt. Areas of employment include government agencies, educational entities, nursing care facilities, outpatient facilities, hospitals, and diagnostic and medical laboratories. Students will have access to the Learning Resources Center, which includes a 30,000-volume library and computer resources. Cultural benefits include an art gallery and a performing arts center. Coursework for the San Antonio College medical assisting program covers both administrative and clinical subject matter, including bookkeeping, patient scheduling, office management, vital signs, phlebotomy and bloodwork. Its graduates will be prepared to work in clinics, doctors offices and a variety of other environments in the field. The school boasts the country's first accredited medical assisting program, which the college first developed in 1969. Students can choose from an associate of applied science degree or a level 2 certificate. The school offers academic advising, career services, library and research tools, counseling and disability services. Graduates of the Laredo Community College medical assisting program will be qualified and prepared for immediate entry into a wide range of ambulatory settings and professional medical facilities. Enrollment management services are available to help new and current students choose the right courses, and Learning Enrichment Centers exist to serve students in a variety of academic capacities, including study areas, tutoring and computer-based tutorials. The school also participates in the U.S. Department of Education's TRiO student support services program, as well as the Upward Bound program. Students will have access to academic advising, career services and counseling. Students enrolled in the medical assisting program at Texas State Technical College-Harlingen will experience the full variety of resources, activities, organizations and resources that the college offers. This includes the Student Government Association, talent shows, volunteering and community service opportunities, student trips, intramural sports and leadership activities. Support services include the Humana student assistance program, referrals for child care and a variety of counseling services. Upon completion of the program, students will be qualified for entry-level work in the medical assisting field, which includes both administrative and clinical duties and responsibilities in a variety of professional medical settings. The medical assisting program at El Paso Community College provides a special focus on technology. Clinical coursework prepares the students to conduct patient care, and administrative competencies ready graduates for work in clerical and office management functions. The program is accredited by the Commission on Accreditation of Allied Health Education Programs and the Curriculum Review Board of the American Association of Medical Assistants’ Endowment. Students must offer proof of CPR certification prior to enrolling, and there are also immunization requirements. Students will receive guidance from advisors, as well as access to counseling, disability services and career services. For those wishing to pursue a certificate program or a two-year degree in medical assisting in Texas, there are several options, including community colleges, trade schools, vocational schools and four year colleges. This search tool is designed to help students find the right medical assisting schools in Texas metro area, based on individual interests, needs, budget and location. How does Texas define "medical assistant"? Certification is not required to work as a medical assistant in Texas, but highly desired by most employers. Certification as a CMA (Certified Medical Assistant) through the AAMA (American Association of Medical Assistants) is one of the desired certifications for most medical assisting jobs. Certification as a medical assistant in Texas can be achieved by completion of an accredited medical assisting program prior to taking the certification exam. Is a formal education and/or training required for Texas medical assistants? Formal training is not a requirement to work as a medical assistant in Texas. It is possible get experience as a medical assistant (MA) with on-the job training, but most employers will want to hire someone who has completed a medical assisting program. Employers want medical assistants that can perform a wide variety of tasks and will seek out those who have had some formal education and certification. There are no additional educational requirements for medical assistants in Texas. If you are certified, you will want to keep your MA (medical assistant) credentials current, along with an annual membership to your certification organization. As a registered MA, you may also be required to obtain a certain amount of continuing education credits per year. Are there tasks outside the scope of medical assistants in Texas? Salaries for medical assistants vary significantly across the country. This table shows a comparison of what a medical assistant in Texas earned in 2014, compared with the national average. The following table compares medical assistant wages across three metropolitan areas of Texas in 2014. According to this information, salaries vary considerably throughout the state, based on geographical location. The medical field is ever-changing, and the demand for support personnel such as medical assistants is increasing. For those seeking a career in medical assisting in Texas, the outlook is good, with a strong projected growth rate of almost 32 percent for medical assisting jobs in the next few years. The following table shows current growth rate along with projected growth rate for medical assisting jobs in Texas, compared to the national average. Whether you are looking to earn a certificate or an AAS degree in medical assisting, Texas has a very large selection of schools to choose from, located throughout state, and many schools here offer the choice between a certificate and an AAS degree. Depending on your needs, budget and location, the options include community colleges, career colleges, vocational schools, and even some four year colleges. The following spotlighted schools offer a good look at the types of schools available in Texas. Website for the American Registry of Medical Assistants (ARMA), a national registry for medical assistants. Texas medical assistants can apply for RMA (Registered Medical Assistant) credentials, maintain membership and access continuing education activities through the site. This website offers an overview of occupational profiles, including medical assistant, with information specific to each state. It shows employment trends and wages for Texas, and offers a comparison between Texas and the national average. This website has career tools as well as salaries for Texas medical assistants and allows you to compare salaries between towns.